Did you know that Jesus is an ardent, jealous Lover who enjoys nothing more than to shower His Bride–the Church, the Body of Christ, which includes YOU–with the blessing of the bride? It’s true. Because we are in covenant with Him as His bride, we have a certain standing with Him. It’s not a distant standing, either. It’s a close one that entitles us to covenant blessings. As believers in Christ, we have high priority to Him. Scripture appears to show that we have a higher priority than anything and anyone else except the Father and the Holy Spirit. Think about it. Angels sinned, but Jesus didn’t redeem the fallen angels. He did, however, sacrifice everything He had to get you and I back. And still today, Isaiah 43:4 tells us that He continues to give up other men/people for our lives. You and I are important to the Lord. Yes, YOU are important to Him. YOU. We are Jesus’ Bride. He gave up everything for us once, and He continues to pour out today. So, because of our covenant place at His table as the Bride of Christ, I firmly believe that it’s time for us in the Church to ask our Lord and Savior–our Bridegroom and Kinsman Redeemer–for the blessings of the Bride. 1. A passionate love relationship with Jesus. Set me as a seal upon your heart, as a seal upon your arm; for love is as strong as death, jealousy as cruel as the grave; its flames are flames of fire, a most vehement flame” (Song of Solomon 8:6). Don’t you desire to love Jesus like that, and to feel His fiery love for you as well? I know I do. And I love Jesus, but I know I could love Him so much more. I even sense His love, but I want to sense it so much more. You may be the same way. You love Him, but you want more intimacy; more closeness; more passion for Him. We should all want that. And guess what? As His Bride, the Lord has promised to give us that intimacy with Himself. We shall know Him … and the Hebrew word for “know” isn’t a dull, boring intellectual knowledge. It’s the same kind of intimate getting acquainted with that God wrote about in Genesis 4:1, when He said: “And Adam knew Eve his wife; and she conceived ….” That’s right. By His covenant, God has promised that He will cause us to know Him deeply, intimately, familarly, lovingly. Wow. That’s an awesome blessing of the Bride, don’t you think? 2. Unexpected encounters with God. ‘Rise up, my love, my fair one, and come away. For lo, the winter is past, the rain is over and gone. The flowers appear on the earth; the time of singing has come, and the voice of the turtledove is heard in our land. The fig tree puts forth her green figs, and the vines with the tender grapes give a good smell. Rise up, my love, my fair one, and come away! The passage above was just one of several unexpected encounters between the bride and her Beloved in Song of Solomon. And just like Solomon wooed his bride, Jesus woos us unexpectedly. How does Jesus woo us unexpectedly? That time when you woke up in the middle of the night, completely unexpectedly and totally awake. After a minute of wishing you could sleep, you had the spontaneous thought that you should sneak away to be alone with the Lord. Whether you actually got up or not, that spontaneous thought was most likely Jesus, calling to you. When you’re driving in your car, and you suddenly sense His presence. Maybe it was in the middle of a worship song on a CD. Maybe it was just while you were driving in peace, or praying. Those are unexpected encounters with the Lord. When you’re sitting at your office and you get a sudden urge to pray about something. It’s not in your head. Jesus is encountering you, and He needs you to agree with Him about something that is on His heart. When you’re thinking about going out in the evening, but you feel a drawing from the Holy Spirit to spend some time with Him at home instead. All of these situations are unexpected encounters with Jesus. And why does He woo us unexpectedly? I’m sure I can’t give a comprehensive answer, but I do know that He loves romance. He loves spontaneity. He loves to surprise us by showing us that He’s been thinking of us, and how important we are to Him. Tip: You don’t have to wait to feel a special wooing from the Lord in order to have an intimate encounter, either. Solomon’s bride wasn’t waiting for him to come to her. She asked him to draw her away! And you can do the same thing. If you’re hungry for the Lord, get away from work, school, or washing the dishes and sneak into your secret place with Him. EVERY time I have done this, without fail, He has encountered me there with power. Getting away from the hubbub of life for even a few minutes can be a real sacrifice, but Jesus will reward your sacrifice. Every time. 3. Unexpected revelation, strategy, vision, and understanding. Sometimes He wants to fill us up with a fresh dose of His love. Sometimes He wants to download strategy and blueprints for the next season of your life. Sometimes He wants to teach us. Sometimes He just wants to hug us. I can’t tell you how many times I’ve felt dry inside and the Lord has woken me up in the middle of the night, asking me to come away with Him. I’m sorry to say that I haven’t always obeyed. But every time I have–without exception–He has encountered me with power. He has comforted me, drawn me deep into His glory, and baptized me again with love, hope, and courage. He loves to download vision into us too. I just got back from a writing retreat, and the Lord woke me up earlier than expected twice and drew me into His Word. The first time, as I studied and prayed, He spoke a prophetic word into my spirit that really meant a lot to me. It comforted me about a very specific thing that had been going on in my heart, and you all told me in your comments that it meant a lot to you too. That word was an unexpected thing the Lord woke me up to receive. The second time, He told me to start writing down my blog strategy for 2016. I got out my journal and started writing, and He started downloading. He gave me so much that, pretty soon, paper and pen weren’t enough. I got out my computer and started typing there instead. Within a very few minutes, the Lord just downloaded month after month of article titles, article series, and strategies for 2016. It was unreal. I was in awe. I’ve never had a strategy this clear, and I couldn’t have come up with it on my own. But I would have missed the whole thing if I hadn’t responded to His wooing. Unexpected revelation. Unexpected teaching and gifts. He’s a generous God, and He loves to shower His bride with gifts of all sorts. I come before You in Jesus’ name. Father, I love You so much. Thank You for saving me and making me Your own. Thank You for redeeming my life and forgiving my sin. Thank You for making me the Bride of Christ. Father, I know that You love me. I know that Jesus and the Holy Spirit love me too. And Father, I desire to love You like You love me. Specifically, I desire to love Jesus and treat Him as a bride should. Father, would you help me? Father, I ask in Jesus’ name that You would give me a passionate love for Jesus that exceeds every love I’ve ever had before. Help me to honor Him and adore Him with my words, thoughts, heart, and actions. Help me to think of Him always. Help me to abide in Jesus the way You asked me to. Father, I pray that You would fan the flames of passion for You, Jesus, and the Holy Spirit in my heart. Consume me with love for You. Help me to receive Your love, also; to feel it and sense it; to eat it and drink it; to breathe it and smell it. Help me to roast and sozzle and marinate in Your love all day, and in the love of Jesus. Lord Jesus, I ask also that You would help me to encounter You in ways I expect and in ways I don’t expect. Help me to go aside during the day and just be with You. When You woo me unexpectedly, help me to answer You. Help me to come away with You every time. Help me to realize that it’s You calling me, that You are wooing me, and that it’s not something I made up. And Lord, when I answer Your call to draw away with You, please help me to encounter You with power every time. Help me to receive everything You have for me. Help me to hear Your voice, feel Your kisses and Your embrace, and see Your face. You promised that if I love you, You would manifest Yourself to me. So I claim that promise in Jesus’ name. I love You, Father. I love You, Jesus. I love You, Holy Spirit. Please shower me with every blessing of the bride today, and draw me closer to You than I have ever been. Thank You. Thank You for hearing and answering my prayer. 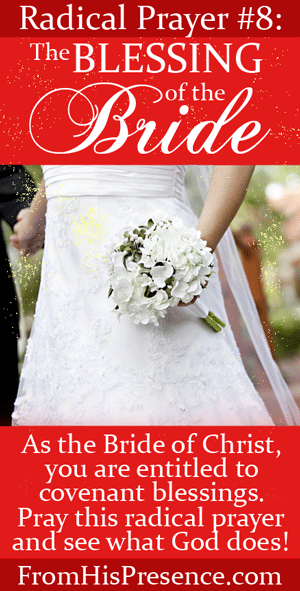 Does your heart yearn for more of the blessing of the bride? If so, leave a comment below! And if you can think of other blessings of the bride, please share your thoughts also! Thank you Jamie! That whole message was just for me. Thank you for obeying the Holy Spirit, and putting it out there. POWERFUL!!! God Bless you! Tim, thank you so much for letting me know. I have been praying for you and Dee (from my previous conversations with her), and I pray the Lord would move powerfully in your lives. I hear the word “propel.” So I pray He would propel you into your new season with His mighty hand and His outstretched arm. In Jesus’ name. I once received a vision of myself a bride, I was dancing before the Lord, there was a banqueting table and there was a crowd of people around a large hall. I have gone through a very difficult period in my life in the last couple of years, and I have prayed that this vision may become a reality, that the love and the joy of being his bride may be present. That’s an amazing vision! Thanks for sharing! I love it! Jamie, I’m so glad and thankful God calls you to spend that special time with Him. I can’t wait to read your post each day! I appreciate you being so open and willing to listen and obey the prompting of Holy Spirit. That’s why you are reaching so many and helping us to walk a closer walk with Jesus. I’m going to start being more sensitive to His calling and go away more with Him AND expecting to hear more from Him. YES! Thank You LORD! Jamie, thank you again! As I was walking my puppy this morning I felt so dry and empty, but I prayed in the Spirit. When I got home and read the blog and prayed the prayer, I felt as if those words were an interpretation of my prayer. I feel so thankful and blessed. My heart is full. Thanks again! Wow, praise God! That’s so awesome! And thank you for letting me know! And btw, something else that doesn’t have anything to do with your exact prayer per se, but Papa just used your comment to bless me too. I thought you’d be tickled by this: You used the word “interpretation.” I’ve been praying for the gift of interpretation of tongues. And when I saw your word “interpretation,” I felt like that was a sticky note from Father telling me He had heard my prayer. Just a little secret poke from the Lord. 🙂 just another way the Lord speaks to us in special ways! Thanks so much for taking the time to share! ?? So thank you again, Jamie…for your agreement. We lifted you up in prayer today, and thanked God for your steadfast, steady, sturdy, unflappable commitment to serving Him through your media ministry. You are a POWERFUL woman of God. Please know that you ARE making a difference, and that your labor is NOT in vain. Not even close. I speak 3 John 2, the blessings of Abraham and the protection of Psalm 91 over you and your family. Happy, blessed, prosperous, supernatural New Year. Well, now you’ve done it. I’m sitting at my desk at work with tears in my eyes from what you just said. ?☺️ I love our Daddy God! He’s so good! GO JESUS! And I receive that blessing too! Thank you so much for your prayers! I really appreciate them! Before I woke up this morning between sleep and awake I felt the Master wooing me into His presence, so I lingered there laying in His arms enjoying the time with Him. I am lead to read your blog and receive understanding of what just happen to me moments early. Praise His Qodesh name. I know he loves me as His bride. He sure does love you! He’s so awesome! I’m so glad He showed you His wooing in your quiet time. May our Daddy God continue to bless you, and may you have radical encounters with Jesus this year! Oh, that women will give in to that wooing. I’ve linked up my blog today with an article on Peace and Quiet Brings Rest. I’ve already started encouraging others to forget resolutions and focus on Jesus and one word a day, for Jan. 1, I chose cherish. ( Wisdom ) Cherish her, and she will exalt you; if you embrace her, she will honor you Proverbs 4:8, I’m already well in the month. If anyone want to do it, choose your own word or borrow mine. Have a blessed 2016, in our beloved Bridegroom. I just love this, it’s so very powerful. This is truly awesome, keep it coming. Thank you for that article. It really ministered to my heart about some things. I’m so glad Papa touched you, Nancy. Thank you for reading. May He overwhelm you with the blessings of His bride this very day, in Jesus’ name! Thank you again Jamie, for leading me in prayers I wouldn’t necessarily know how to verbalized on my own but speak of the deepest desires of my heart. I take these prayers very seriously, not just reciting them, but tearfully speaking them aloud in agreement with the Holy Spirit to our Father through Jesus’ name. This prayer was no exception. I prayed with tears running down my face and a precious aching in my heart to experience all the blessings of Christs bride. Who knew I would wake up this morning to this deep desire coming to the surface in such a way but God, who knows our hearts desire. Wow, Rebecca, I’m so glad our Lord used this prayer to help you, and that He touched you through it. I’m so sorry I am just now having a chance to respond to a lot of comments. But I got yours right away, and I about cried. The only reason for any of us to try to encourage others is just for that purpose–oh if only Papa will use whatever we do to draw people to Christ! There really is no higher aim but just to know Him. Thank you so much for letting me know. Have a wonderful day! This so ministered to me.It is my heart’s desire to love the Lord as passionately as He does me.To just be filled,overwhelmed,to overflow with and pour out His love,Not only for Him but for people. Yes, yes, yes. That’s the most perfect heart’s desire I could imagine! Let it be so, Lord, let it be so for all of us! Jamie I came across your blog today when I searched for info related to prophetic transition.Your post from November 2015 on that topic was soo helpful to me that I decided to continue scrolling through your posts. I came across this particular one on the Bride of Christ. At the start of 2016 the Lord has me studying on the Bride of Christ from Mike Bickle’s resources. This blog post is sooo amazing and the prayer is powerful and beautiful. I just had to encourage you!! Thank you for being obedient to Holy Spirit. God bless you my sister!! Amen, Janille. I’m soooo sorry it took me so long to respond to your comment! I’m just now finding some comments that hadn’t been moderated that I didn’t know were here. Please forgive me. But thank you so much for reading and for your encouragement. I really appreciate it. I’m so glad our precious Papa blessed you through this post. May He continue to pour out His Spirit all over you and everything in your life today! I am so excited to have been “Led” to your site,thank you for being so sensitive to The Holy Spirit. I look forward to sharing some wonderful answers to the beautiful prayers you have listed here. I lack too much faith. I keep doubting and failing. I don’t think praying will work for me. I don’t think I’m special to God . I don’t think there’s hope for me to be truly happy in this life. I don’t feel like God is for me. I don’t think He wants to woo me or encourage me at all. I feel helpless, hopeless, abandoned and worthless. Then you are listening to lies from the enemy, Lisa. I encourage you to read my series on How To Become a Spiritual Warlord and strengthen yourself in the Lord. The enemy can’t deceive you unless you let him. God’s Word is the Truth. Everything that goes against God’s Word is a lie. And the things you said above are lies from Satan. Father God loves you very much. If you have given your life to Him, then you have total and complete access to Him through Jesus Christ. If you have not given your life to Him, He wants you too. He earnestly desires you to be close to Him. He misses you and adores you. His heart beats for you. I pray you would decide to believe God instead of the enemy’s lies today. Grace and peace to you in Jesus’ name. I’m saved, but I can’t reach intimacy with Him. That’s why saying things like “His heart beats for me” brings me extreme pain. And since I can’t reach intimacy with him I fail miserably and constantly in my spiritual life. For that reason, I’m sure God will not hear my prayers and will not care to help. All of which you can do something about. I encourage you to go after Him with all your heart. It is worth every sacrifice to know Him. I have been praying your radical prayers daily along with my own. I am homeless and have been for over a year. I asked God for a miracle before last October. He answered half of it and I am still waiting for his answer to the other half concerning a home of my own. The first half was getting approved for disability. The money has not made a difference because no one will rent to me without credit. I also have 25 cats to take with me. I have no transportation, no family, and no way of getting any of these things accomplished in my own power. That’s why it is a miracle. I was evicted last November, but by the grace of God, I am still here for a few more days. When will it be my time to reap? Please pray for me. I am losing hope and faith. The God Of Moses and the God Of Elijah who makes a way outta nowhere will come through for you in Jesus’ Name.